How Far is XS Real Green Edge? There is a point where a living space becomes an embodiment of its age. And also make a statement of style and luxury. A statement a few special people will get to appreciate – and spend their lives in. A statement called GreenEdge. 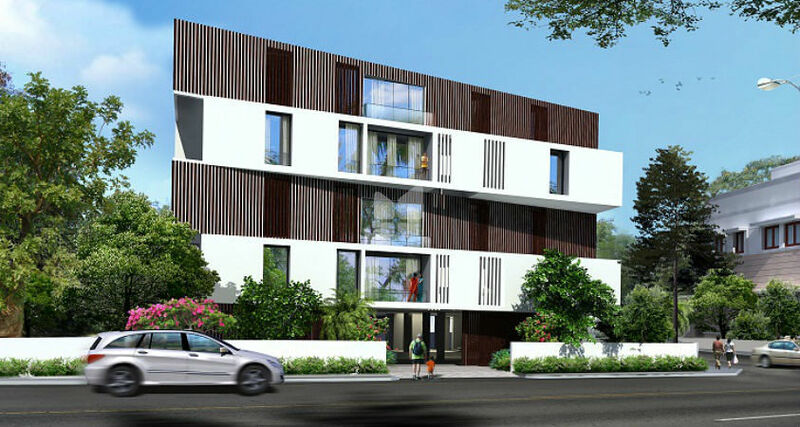 GreenEdge is a contemporary work of art – Duplex Bungalow apartments in Chennai at Royapettah Balaji Nagar speak volumes of luxury. RCC framed structure with seismic zone III compliance. Walls will be of Brick/ Concrete block/ Fly ash brick or any other suitable material. Agglomerated Marble for the entire flooring excepting Kitchen & Toilets. Anti skid/ Matt finished vitrified tiles for kitchen & Service area. Antiskid ceramic tiles for Toilets. Duplex house internal staircase – Agglomerated Marble / Granite treads & risers. Agglomerated Marble/ Granite for Foyer. Designer glazed tiles for all Toilet walls upto ceiling. Designer glazed tiles for Kitchen wall to a height of 2 feet. Designer glazed tiles for Service wall matching the kitchen wall tile height. Main door - Single leaf Teak wood panel door fixed to Teak wood frame with Biometric lock and keys, viewing lens & safety chain. Bedroom doors - Masonite door fixed to teak wood frame with Hafele or equivalent cylindrical lock. Toilet doors - Plastic coated one side teak veneer flush shutter fixed to Teak wood frame with Hafele or equivalent cylindrical lock. Balcony - Teak wood French doors with clear glass panels integrated with safety grill, white melamine paint on the exterior and natural wood finish on the interior. UPVC windows (Fenesta or equivalent) with plain glass and safety grills. Aluminum ventilator frames with fixed louvers, safety grills & exhaust fan provision. CPVC & UPVC piping for water supply. Water connections from the overhead tank with pressure booster pump. Provision for washing machine, dish washer and aqua guard. Master bedroom toilet - Roca / equivalent brand single lever mixer with overhead rain shower & a health faucet. Other Bedroom toilets - Roca / equivalent brand, single lever mixer with over head shower & a health faucet. Every Toilet will have shower partition. All toilets - Roca or equivalent brand white wall hung closet with concealed tank & ceramic monolithic counter wash basins. Dining area will have ceramic bowl wash basin. Interior walls - Two coats of Putty, one coat of primer and two coats of acrylic emulsion paint of Asian/Berger/Nerolac or any other equivalent brand. One wall in the Master bedroom shall have metallic accent paint. Exterior walls -Two coats of antifungal emulsion paint over a coat of primer of Asian/ Berger/Nerolac or any other equivalent brand. Matt finish melamine coat for all wooden surfaces excepting toilet doors. Matt finish melamine coat for the toilet door surface facing the bedroom & the surface facing the toilet will be finished with plastic coating enamel paint. Three-phase Electrical supply with Mini Circuit Breakers (MCBs) and Residual Current Circuit Breaker with the main switch connected to consumption meter. Modular switches with concealed copper wiring in PVC conduits. Three 5 amps plug sockets, one fan point, one lamp point and one tube light point in all rooms excepting kitchen & Toilet. One chandelier point for Living. Two way control for one light and one fan point in all bedrooms excepting master bedroom. Master bedroom will have remote controlled switches for the fan and light point. One AC point for all bedrooms and Living & Dining. Four 5 amps plug sockets, one tube light point, one light point, one fan point, one exhaust fan point, one aqua guard, one dishwasher point & two 15 amps plug socket points for Kitchen. One light point and 15 amps points for washing machine in service area. One light point, one mirror light point, one 15 amps plug socket for Geyser, one exhaust fan point & one 5 amps plug socket for all toilets. One light point and one fan point & an Unjal hook for balcony. Telephone points with 5 amps plug socket with cable for living and all bedrooms. Conduit provision for all bedrooms & Living for DTH. Three 5amps points one each for home theatre, TV and DVD in Living and Master Bedroom. One fan point, One light point and two 5 amp plug sockets in Lounge area of Duplex apartment and one light point in internal staircase area. 100% Power back up for all electrical points through common Diesel Genset with Automatic change over. Manual phase changer near the main board. Polished Black / colored Granite cooking table & Carysil/SS sink with drain board. Granite/Agglomerated Marble seat with shoe rack space. XS Real Centra, another upcoming project of XS Real is the center of attraction among users, built with 1.5, 2 and 3 BHK Apartment for sale in Perungalathur GST.